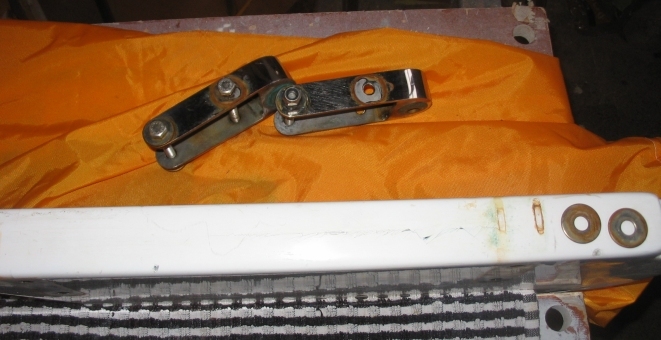 The owner was concerned about a crack on the forward edge of his rudder, between the two gudgeons. He wanted a quick repair before heading off to the 2008 Southerns at RCYC. 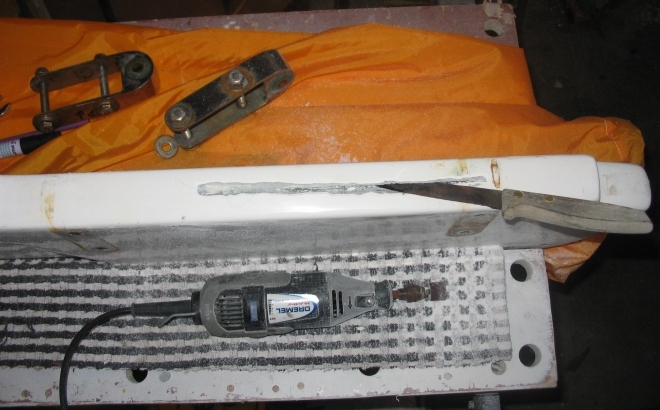 The rudder is locked into the Workmate vice, with protective padding on each side, an old tea towel on one side and a spinnaker bag on t'other. First step is to remove the two gudgeon fittings with a pair of 13mm spanners. 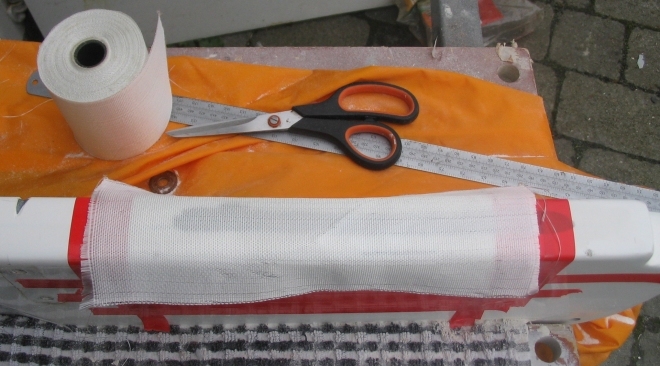 Label each gudgeon so that it can be refitted in the correct orientation. 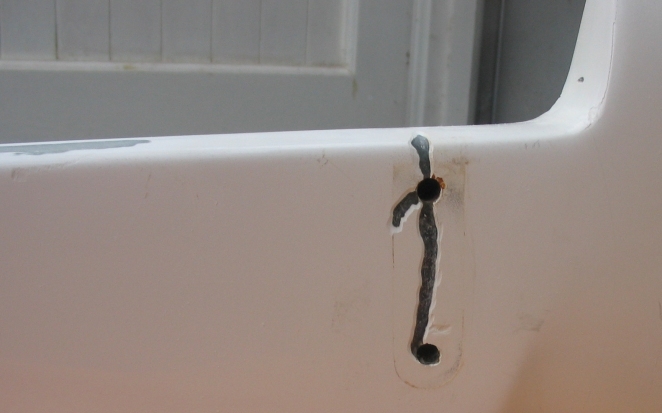 The rust is caused by the washers, poor quality stainless steel, as seen here. This is an old steak knife (every tool box should have one), good for exploring the void in the layup beneath the cracks. 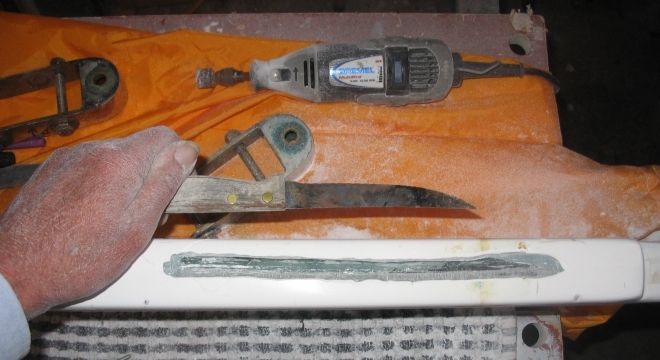 After cleaning with an old toothbrush and acetone, a mix of West epoxy resin with microfibres is poured into the wound. A coffee stick is used to vibrate the epoxy mix into the void, in the same way as concrete is vibrated into a form. 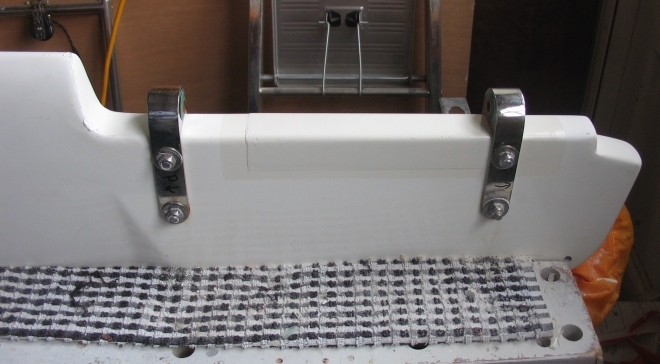 A thinner mix of epoxy resin would have flowed more easily, but the addition of micro-fibres makes a much stronger but less viscous mix and needs to be poked and prodded into the void. Time taken to do the above: 45 minutes. 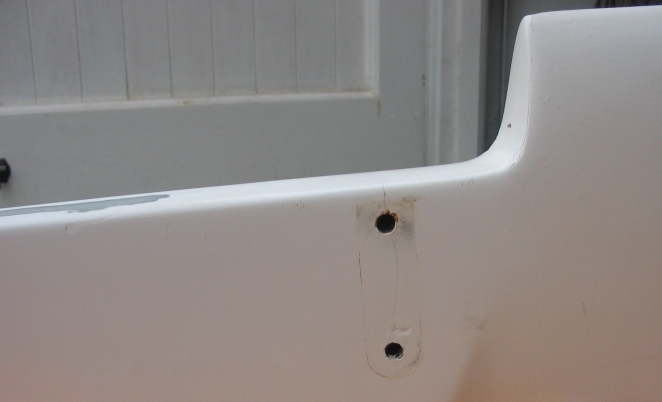 Mr Dremel has opened the crack and it seems to be gelcoat only...We will fill this with gelcoat. 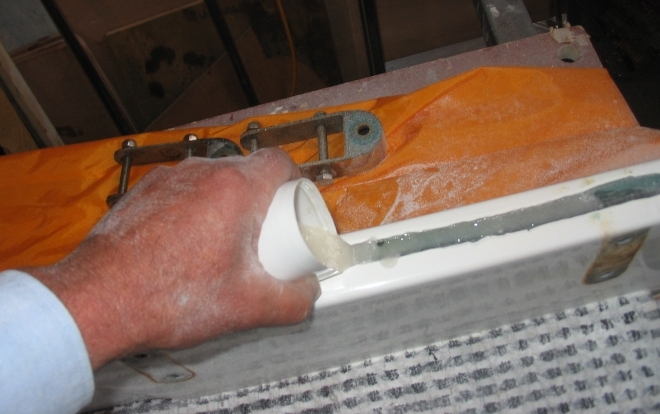 To be sure to be sure, a layer of e-glass tapespecifically for epoxy resin, will be applied to reinforce the repair. 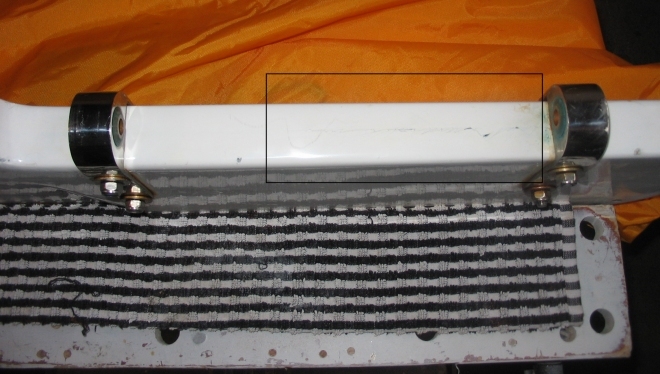 Lots of red insulating tape (epoxy resin will not stick to insulating tape) has been applied to define a repair area. ..and here a layer of thin polythene film has been overlaid, and excess epoxy squeegeed out with an old credit card, a poor man's vacuum bag, to ensure a tight yet smooth adhesion. 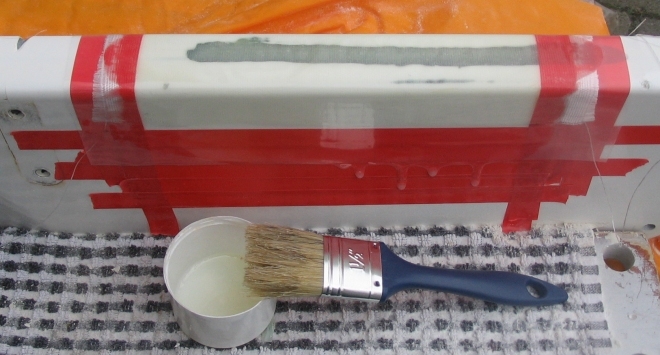 Excess resin runs onto the protective tape. Time taken to do the above: 30 minutes. 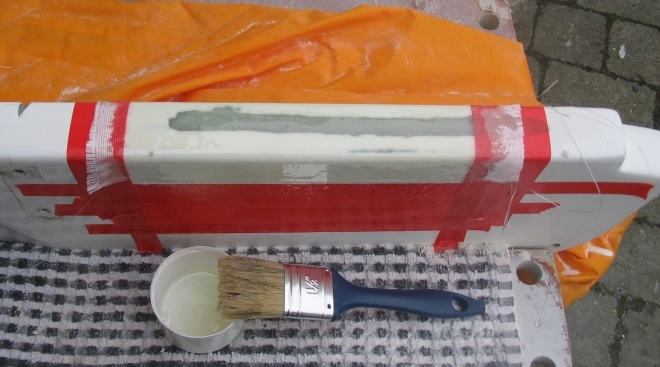 The next morning...peel off the polythene and the red tape, scrub the waxy amine blush off the epoxy with a green scrubbing pad and fresh water. Purposely did not tape where the gudgeon goes, lest it not fit. A couple of coats of quick dry spray paint, re fit the gudgeons with silicone in the bolt holes and away to Cork.